Our organization then, now, and in the future. FFA is an integral part of agricultural education by helping make classroom instruction come to life through realistic, hands-on applications. FFA members embrace concepts taught in agricultural classrooms nationwide, build valuable skills through hands-on experiential learning and each year demonstrate their proficiencies in competitions that showcase real-world agricultural skills. Today’s FFA has evolved in response to expanded opportunities available in agriculture and its needs to hire skilled and competent employees for more than 300 careers. The organization helps students prepare for careers in business, marketing, science, communications, education, horticulture, production, natural resources, forestry and many other diverse fields. The agricultural education program provides a well-rounded, practical approach to learning through three components: Classroom education, hands-on supervised agricultural career experiences, and FFA, which provides leadership opportunities and tests students’ agricultural skills. The Florida FFA Association is governed by a board of directors comprised of teachers and students, charters local chapters and provides direction, program materials, and support for local chapters. Its headquarters are in Gainesville, Florida, and its Leadership Training Center is located in Haines City, Florida. In 1928, 33 students from 18 states gathered in Kansas City, Mo., to form the Future Farmers of America. The roots of FFA originate from a time when boys were losing interest and leaving the farm. Walter S. Newman, who in September 1925 became the Virginia State Supervisor of Agricultural Education, sought a solution to the problem with Edmund C. MaGill, Harry W. Sanders and Henry C. Groseclose, staff members of the Virginia Polytechnic Institute Agricultural Education Department. Groseclose immediately began work on a constitution and bylaws for the new organization, and J.O. Hoge later suggested a name: Future Farmers of Virginia. The idea was presented during an annual vocational rally in the state in April 1926, where it was met positively. The Future Farmers of Virginia was born. Two years later, the idea reached the national stage during the American Royal Livestock Show in Kansas City, Mo. That’s when 33 young students from those 18 states gathered at the Hotel Baltimore to establish the Future Farmers of America. The group elected Leslie Applegate of Freehold, N.J., as its first president and adopted the national emblem – a mark similar to that of the original Virginia emblem – during the new organization’s first convention. In 1929, national blue and corn gold became the official colors of FFA. A year later, delegates adopted the official FFA Creed and by 1933 the familiar Official Dress of blue corduroy jackets was adopted after convention delegates were enthralled by the jackets won to Kansas City by members of the Fredericktown, Ohio, FFA chapter. 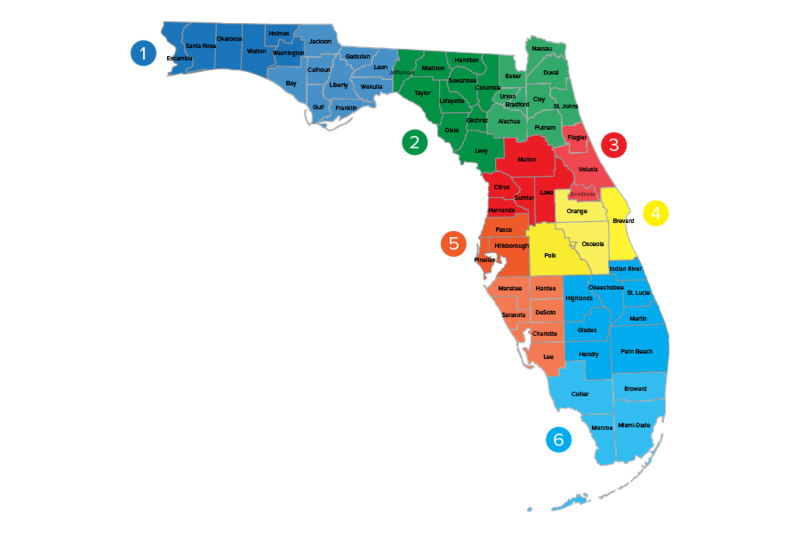 In accordance with the Florida FFA Constitution, Florida FFA is divided into six regional areas (I-VI). Each area is sub-divided into two districts, and these districts are divided into sub-districts based on membership, participation levels, and geography. Areas, districts, and sub-districts are used for levels of competition for some career development events and officers at the respective levels. FFA is an integral part of the Agricultural Education program. To join the FFA you must be enrolled in an Agricutlural Education course in your local school. Contact your school’s counselor or Agricultural Education instructor to enroll in an agricultural class and join the FFA. FFA is not a “club.” It is one of three integral components of an agricultural education program: classroom instruction, supervised agricultural experience and life skills. Students between the ages of 12 and 21 who are enrolled in a systematic course of instruction in agricultural education are eligible for membership. Your local school system must offer agricultural instruction and have an active FFA chapter for you to join. If your school doesn’t have an agricultural education program, take steps to open a program in your school. In order to accomplish this task we strongly recommended that you contact your state agricultural education staff to express your interest and ask for assistance on regulations, requirements and resources for planning the new program. Ready to start an FFA Chapter? Check out the Starting a FFA chapter page for more information.